November 1986. The Zonta Club of South Auckland, Feasibility Meeting to look at starting the new club of the Zonta Club of East Auckland Area. July 6th 1987. An Organizational dinner was held at the Panmure Hotel, Queens Rd, Panmure, chaired by Area Director Shirley Pope. August 23rd 1987. 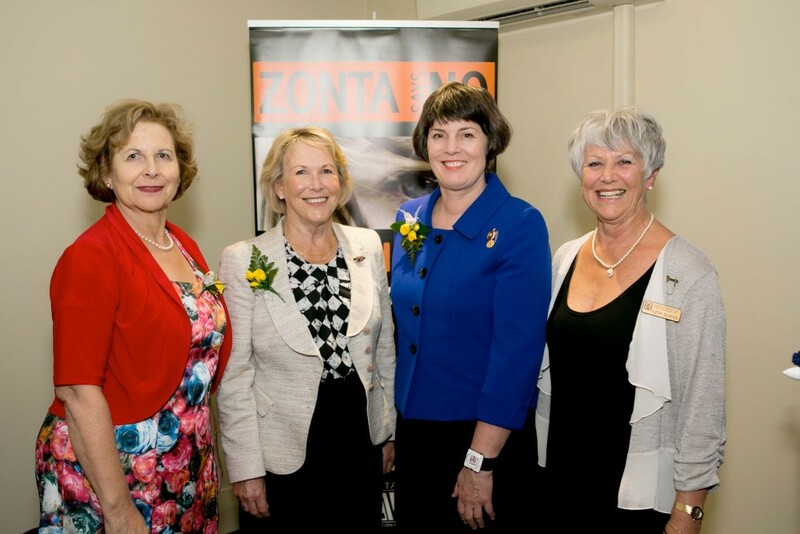 The Charter Presentation of the Zonta Club of East Auckland Area at Waipuna Lodge, Mt Wellington. Guests of Honour included – International President, Mrs Amey Grubbs, USA, and District VI Governor, Mrs Val Sarah, Australia. The first Board meeting was held at the home of President Elect June Hieatt, 6 Cammell Close, Bucklands Beach. The initial meeting of the Club was held on the 29th July 1987 at Finnerty’s Restaurant, with subsequent meetings held on the first Wednesday of the month at the Belvedere Lounge, Basin View Lane, Panmure. Venues were changed several times, to the Social Room at the Pakuranga Cultural Centre, Howick Country Lodge, Homestead Café at the Howick Historical Village, St Columba Church and the Pakuranga Golf Club. A wide variety of speakers have been invited to speak over the years, with many being from the various charitable organisations the Club has supported. The Board has comprised of – President, Vice President(s), Past President, Secretary, Treasurer. Initially there were six Directors and committees but because of dropping membership in 1996, the following committees were combined – Membership/Fellowship, Public Relations/Service, Status of Women/International and from the beginning of 2014 an additional committee of Fundraising was established. Women’s Refuge -­‐ Stepping Stones programme, Child Cancer Foundation, Pakuranga Health Camp, National Heart Foundation, Royal NZ Foundation for the Blind, Kidney Transplant Programme, Kidz First Middlemore Hospital, Starship Childrens Unit at Auckland Hospital, St John Ambulance, Women in Prison, Barnardoes, Botany Maternity Hospital, Otara Tongan Creche, Hearing Dogs, Guide Dogs, HIPPY(Great Potentials), Ronald Macdonald House, Daffodil Day and Cancer Society, Totara Hospice, Sophie Elliott Foundation, Howick Plunket Car Seats, Shakti, Alan Duff Books in Homes, Brainwave Trust, Trauma Teddies for children in ambulances, Adopt a Family, Counterstroke Foundation and more. Donations large and small have been made to all the Charities listed above, some being monetary and some goods, clothes and foodstuffs. Christmas visits to local Rest Homes. Clothes, food hampers and establishment of a vegetable garden for Women’s Refuge. Judging Primary and Intermediate School Speech Competitions and Secondary School Debating Competitions. Secondary School Science Awards, Health Displays at Town Centre. Tertiary Education Scholarships. Rose Garden and seat at Botany Maternity Hospital (and yearly maintenance) plus pictures to lighten up the hospital. Vegetable garden and playground at the Pakuranga Childrens Health Camp as well as clothes where required. Christmas gift wrapping for Volunteering Auckland. Daffodil Day, White Ribbon Day and other charitable collections. Business clothing for Dress for Success. Seat for Kidz First Healing Garden. Reclining chairs for South Auckland Hospice. Look Good Feel Better. Car Wash. Cake raffles. Wine and Cheese evenings. Lunch and afternoon tea for Auckland Bridge Club. Auckland Technical Institute dinners. Garage Sales. Silent Auctions. Car Boot Sales. Catered Dinner Party raffles. Luncheons and Celebrity Dinners. Bric-­‐a-­‐Brac and Book Sales. Knitgrips. Golf Tournaments. Musical and Trivia Evenings. Fashion Parades. Progressive Dinners. Theatre evenings. $5 Challenge. Dog’s Big Day Out. Trading Tables. Howick’s Got Talent. Latte cup -­‐ and more. Christmas and Birthday Parties – themes including 1920’s, black and white, B, western, Scottish and elegant. Waiheke Island and Snells Beach Retreat Weekends, Riverhead Boat Trip, Llama Farm visit, Sunday Breakfasts and coffee mornings, Car Rally, Visits to Wineries, Flight on DC3, Clevedon Markets, Guess Who’s Coming to Dinner evenings -­‐ and more. Unicef. 1987 Sale of tickets for South Auckland Zonta Club’s fashion parade. Sale of Women’s Health Booklet. Sale of Unicef cards. Auckland Zonta Club’s Jewelry raffle for Afghanistan Literacy programme. Support of District Projects and other Area 1 Clubs activities. 1987 Letter to local Member of Parliament, objecting to plans to abolish National Family Benefits. Support of District and local events and projects. Letter to Auckland City Councillors reference inappropriate rap entertainment. Amelia Earhart celebrations, Rose Day Awards, Founders Day Awards, YWPA Awards. District Projects have always been supported including Endometriosis, Teen Parenting, NZ Gynaecological Cancer Foundation and the Say NO to Violence campaign. International Projects, Rose Fund and Building Fund, hosting Area Training Days and Forums, displays promoting Zonta in local shop windows and town centres -­‐ and more. We have always had representation at Area and District Meetings and at District and International Conferences and Conventions. In 2013 an Inaugural Awards Night was established, where our YWPA winner, and recipients of our Leadership Award, Founders Day Award, and the Presidents’ Scholarship Award, were presented in a night of glamour and fellowship. Awardees, guests and club members were joined by District Governor Maureen Heine, Area 1 Director Lynda Garrett and local supporters of our Club. Over the years, venues and the end of year dates have been altered several times. The terms of Presidents have varied from biennium to yearly. There are three Charter Members still active in the Club and many who have been members over twenty years. We enjoy our monthly meetings, good food, fellowship and interesting speakers. Our Club is enthusiastic and in good heart. New members are joining. Our Presidents over the years have been of high quality and extremely capable, leading the Club with confidence and in the best ways. Photo taken at the 2014 March meeting with Dame Lesley Max (Great Potentials), District 16 Governor Maureen Heine, International President Lynn McKenzie and Club President Kathy Bigwood.